Has Lynham done secret deals with Tate? 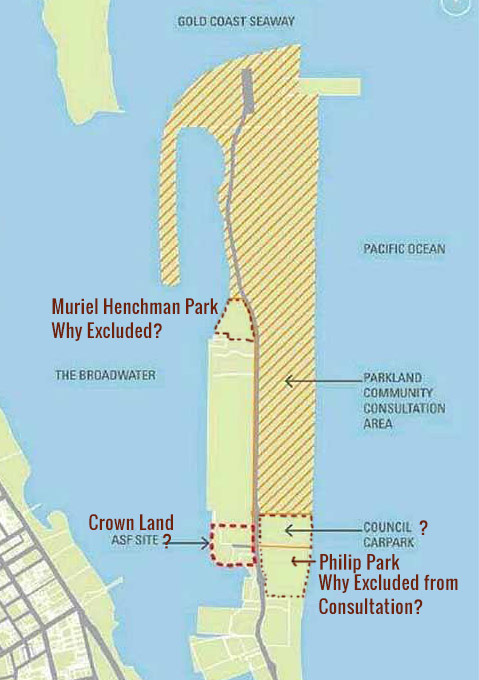 Many Gold Coasters are demanding the reason why the 11 hectare Philip Park (south of Federation Walk Coastal Reserve through to the Sheraton Hotel) was excluded from the current 'Parklands' component of The Spit Community Consultation being conducted and controlled by Minister Lynham's Department of State Development (DSD). Philip Park is a "natural continuation" of The Federation Walk Reserve and widely considered to be a critical component of the entire Federation Walk Coastal Reserve community asset. Philip Park is a "natural continuation" of The Federation Walk Reserve and widely considered to be a critical component of the entire Federation Walk Coastal Reserve community asset. It must be considered that it is part of a whole when it comes to the oceanside coastal reserve on The Spit and the line has always been no development north of Sheraton Mirage. Philip Park did not even exist on the DSD Spit map in their official government 'Public Notice' on 21 January 2017. 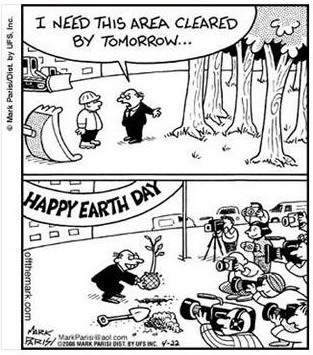 And yet State Government zoning has Philip Park classified as 'Park and Recreation'. Dr Gration asked why Philip Park (which is zoned by the State Government as 'Park and Recreation') was inexplicably excluded from the public parklands currently included in the 'Community Consultation'. The DSD Official replied: I've again, noted what you've said. Dr Gration: Why isn't it included? What's the answer? DSD: The Government has been precise about what they're doing. Dr Gration: Well, let them be transparent. They've been precise but not transparent or honest about it. Because, I'll tell you on the ground, what is being suggested: That DSD has done a deal with Mayor Tate to exclude Philip Park from the Community Consultation because he wants it for his cruise ship terminal. DSD: Well, put in a written submission about it. DSD: Again Steven, we'll have to agree to disagree. Dr Gration: You refuse to answer basic questions about legal frameworks and designated parklands? DSD: Ok well, we'll agree to disagree. Even though Dr Gration gave the DSD Official ample opportunity to deny that DSD have done a deal with Tate for his CST on Philip Park, the DSD Official declined to do so. So in our opinion we have come to the conclusion that Minister Lynham's Dpt. of State Development has done a deal with Tate to exclude Philip Park from the current Community Consultation to make way for Tate's 'thought bubble' oceanside cruise ship terminal off Philip Park on The Spit. And while we are scrutinising this 'process' the public park north of Seaworld - Muriel Henchman Park - is also missing from the public consultation. This is despite Premier Palaszczuk stating clearly that the parks north of Seaworld will be 'protected and enhanced'. Has Lynham done another deal with Tate to replace the Seaworld overflow carpark (currently on the ASF proposed site) by robbing Muriel Henchman Park from boaties, fishers, sailors and surfers (heading to Straddie) who use the boat ramp and boat trailor parking and families and outriggers who use the beach and Broadwater? Government Public Notice Announcing "Spit Community Consultation"
You may also be wondering why the Department of State Development (DSD) public-notice (GCB 21/01/17) announcing ‘The Spit – Parklands & ASF Proposal Community Consultation’, reads more like a real-estate advertisement written by Tate and/or ASF, rather than an official government notice. yet no plans exist and all the community has been shown is a napkin sketch enhanced by an artist of 5-6 high rise towers on The Spit. And then there are the omissions of information from the DSD public notice, such as the negligence in not notifying the public that ASF's proposal is for high-rise and residential apartments in a non-highrise, non-residential area under the current planning laws, the City Plan 2016. 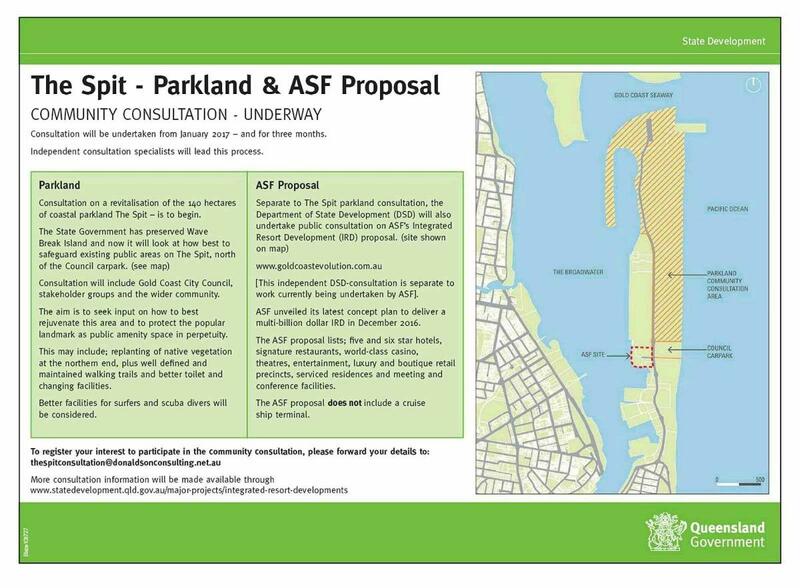 The Spit map on the DSD public notice is also misleading where it designates a 5 hectare section of the Spit as an 'ASF Site' implying that this area is ASF's private real-estate, owned by ASF. This is totally untrue. The area is, in fact, Crown-land (public asset) and not an 'ASF Site' at all. This is where ASF, supported by Minister Lynham's DSD, want to put their proposal but it is not ASF's site. The push poll question that only allows you to tick boxes for the 'positive' things an IRD will bring, no boxes offering you the negative impacts. No mention that an 'IRD' has a casino component. No specific mention of surfing or dog-walking as activities the community participates in on the Spit. Did Tate, ASF and/or the DSD contrive this whole 'Community Consultation' process?? "As GCCC are stakeholders they were involved in planning the consultation - 4 Council Officers are involved – Dyan Curry, Darren Scott, Dale Schroeder and Richard Clark. At the DSD level it is David Edwards, Michael Farrell and Steven Keating". Remember when the ratepayer funded 2012 GCCC Urbis Economic report and VDM Ecological report were inexplicably hidden from the public and eventually obtained through RTI by a member of the community? Correspondence from the Mayor's Office later revealed that Darren Scott's Directorate of Major Projects was responsible for the missing reports. 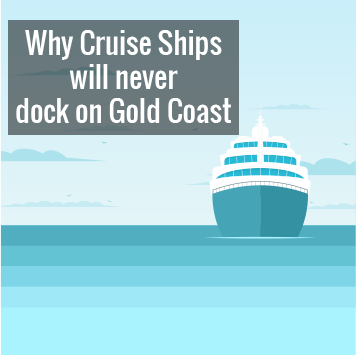 In our opinion, based on GCCC Minutes, Scott has also been a ferocious supporter of a cruise terminal somewhere, anywhere on The Spit or Broadwater since the early 2000s. David Edwards was the Director General of Jeff Seeney's DSD when the LNP were in government. 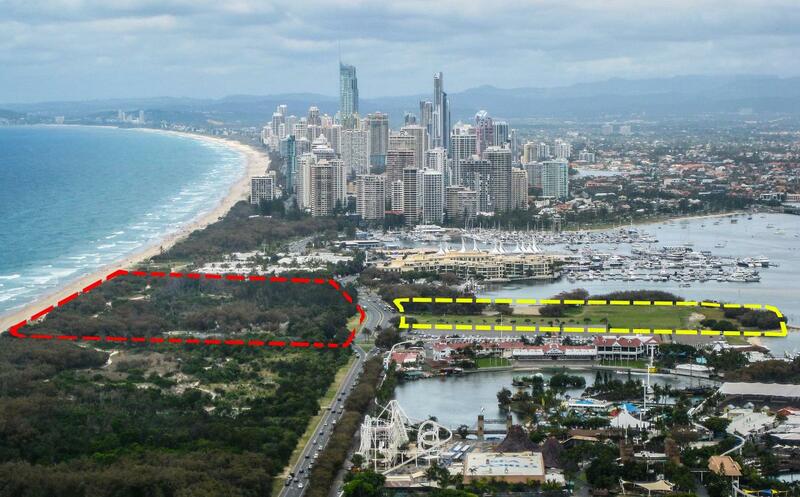 Edwards was responsible for circling the entire southern Broadwater, Wavebreak Island, Doug Jennings Park, Marine Stadium and two sites south of Seaworld for private development and chose ASF Consortium as the 'possible proponent'. And now we find out that Edwards and Scott are instrumental in the construction of the current fouled and flawed 'Spit Community Consultation process' and Donaldson Consulting have to work with the loaded deck of cards that Lynham and Tate have dealt them. Donaldson Consulting appear to be the only ones who are being transparent and honest and conducting themselves with integrity during this current consultation process. Therefore we encourage you to set aside Sunday 19th March to meet with Donaldson Consulting at Broadwater Parklands at 10.30am sharp. Other Save Our Spit research has revealed that this is only the tip of the iceberg regarding what is happening behind the scenes between Minister Lynham's DSD and his senior officials and Tate's Mayoral Office and GCCC officials. Join us for a major event that is being organised for the community where detailed information regarding ASF, casinos, DSD officials, Tate and his CST and GCCC officials will be revealed. We are holding this event, so that you can give informed feedback and ask pertinent questions at Donaldson Consulting's Public 'Community Consultation' day on 19th March in the Broadwater Parklands. And bring your big ideas for the Spit to put into the 'Big Ideas' box on the night. Speakers: Save Our Spit President Dr Steve Gration, Gold Coast & Hinterland Environment Council's Lois Levy and Save Our Spit's Luke Sorensen. www.saveourspit.com and sign up for 'subscriber' emails. Please donate to SOSA if possible, to allow us to continue our quality research and to get factual information out to the community. Save Our Spit Alliance inc.